After a rejection: what next? After a rejection, the advice used to be: submit somewhere else. Find the publisher who’s a perfect match for the manuscript. Nowadays, the advice is as often: self-publish your eBook. Eliminate the gatekeeper and put the story out there. Find your own audience, cut out the middleman publisher, and only share the resulting heaps of profit with Amazon, Smashwords, or whichever other distributors you use. So, yes, this post is inspired by a rejection. 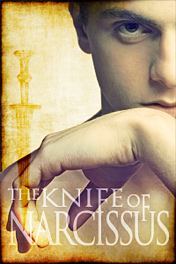 I queried the publisher where I submitted Knife of Narcissus and received a pleasant reply. As rejections go, it’s quite encouraging and complimentary. It’s nice to get that sort of praise from a house whose list I like so much. True, I made a friend read the email first to see how badly it was going to hurt before I dared look at it myself, but it all turned out just fine. As rejections go. Their response does, though, repeat something I’ve been told before. There isn’t really an audience for what I like to write (and read). There aren’t enough people out there who’d want to read m/m set in the ancient world. Truly, my chances would be much better if I could write about hockey players or Navy SEALs. Or even something as modern as Regency. This isn’t the first time I’ve been warned off this setting. So why do I keep writing this stuff? Growing up, I thought these stories (the historical part, not the naughty bits) were as normal and popular as science fiction or crime dramas or noir mysteries, the other books that crowded the shelves at home. The house was full of pulp paperbacks as well as Victorian tomes. On weekends we watched CinemaScope Technicolor Roman epics with casts of thousands, with the occasional Greek myth via Harryhausen or Pyramid-building with actors slathered in Light Egyptian No. 5 makeup. Chariot races and decadent emperors. Pomp and statues. Swords and sandals. I should have focussed more on the science fiction that was also popular around the house, but stories based on ancient topics are at the top of my list of things I enjoy more than anything else (make it a crossdressing heroine time-travelling to the ancient world and I’ll have everything I ever wanted). But, as with any weird hobby, I have to wrap my head around the fact that this is not going to make me a famous novelist, or a popular purveyor of naughty stories. It limits my writing “career” to hobbyist. I’m not sure why I’d want to do this to myself, while watching friends and colleagues expand their creative reach with dark fantasy or contemporary YA or fun middle grade fiction. I can’t even properly say whether it’s out of love for the setting, or contrariness, or not wanting to work harder to write something that doesn’t immediately move my muse. Not everything can be a passion project—not if you want an actual audience. It’s been suggested by friends that I tone the naughty bits way way down and make KoN a PG-level historical, to expand the potential readership for a self-pubbed eBook. I might actually take their advice, for once. I haven’t been very posty the past couple of weeks, which I’d like to blame on being consumed by NaNoWriMo, but which is mostly due to a heavy workload at the day job. But I’ve been babbling in the comments sections of other blogs, and there’s an interesting conversation going on at Jessewave’s about female characters in m/m. It broadened in the comments into a discussion about f/m scenes in m/m (and vice versa). Angela Benedetti wrote an insightful reply bouncing off one of my comments—reposted on her own blog—about staying true to a story versus compromising on content in order to reach more readers, and it’s well worth a read. It certainly left me feeling more inspired to finish the NaNo project and less fretful about the potential audience/market for The Knife of Narcissus. Don’t be afraid to do different. Don’t be afraid to tell stories the way you want to tell them. With genre or page count or style, with voice or plotline or character, I say hop the rails, I say kick down the walls, I say tear up all that yellow DANGER DO NOT ENTER tape. Be bold. Ride the sharp turns. Gallop down the mountain switchbacks. Tell your stories the way you want. Tell the stories that aren’t married to a safe and previously-established pattern. I’ve been enjoying his Miriam Black series. Very intense.